Explore the popular monuments in Washington, DC with this guided, 3-hour tour of the National Mall at night. Hop aboard a deluxe motor coach and enjoy an educational and entertaining narrated history of the nation’s capital. Stop at the White House and United States Capitol, as well as the Lincoln Memorial, the Vietnam Veterans Memorial, the Martin Luther King, Jr. Memorial, and many more. Local hotel pickup included. 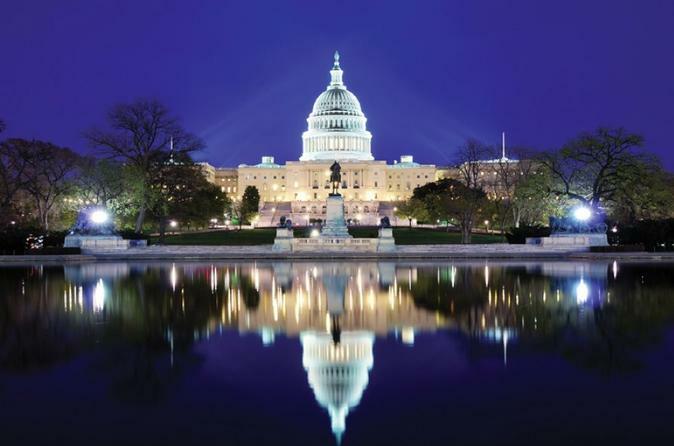 After a pickup from a local hotel or other accommodation, meet the guide and the rest of the tour group at the National Archives Building to begin this comprehensive, 3-hour tour around and through the nation’s capital — Washington, DC. Travel aboard an air-conditioned motor coach with an expert local guide who knows the city of Washington, DC inside and out. See the city and monuments lit up for the evening while exploring the many memorials of the National Mall. Along the way at each stop, the tour guide will answer questions and provide expert knowledge. Stops to get out and walk with the tour guide include the Franklin Delano Roosevelt Memorial, the Martin Luther King, Jr. Memorial, the Korean War Veterans Memorial, the Lincoln Memorial, the Vietnam Veterans Memorial, the Vietnam Women’s Memorial (Nurses Memorial), the World War II Memorial, the White House (photo stop), the US Capitol building (photo stop), and the Iwo Jima Memorial. From the bus, see the National Mall, the Washington Monument, most of the Smithsonian museums, and the National Gallery of Art.